A draughtsman of great dexterity with a wild, often bizarre, imagination. Loved sake, sometimes painting under its influence. At an early age studied under Kuniyoshi, then Maemura Towa and later Kano Tohaku Chinshin before becoming an independent painter at 27. 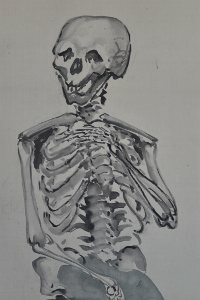 Was famous for his crow paintings but also loved skeletons. 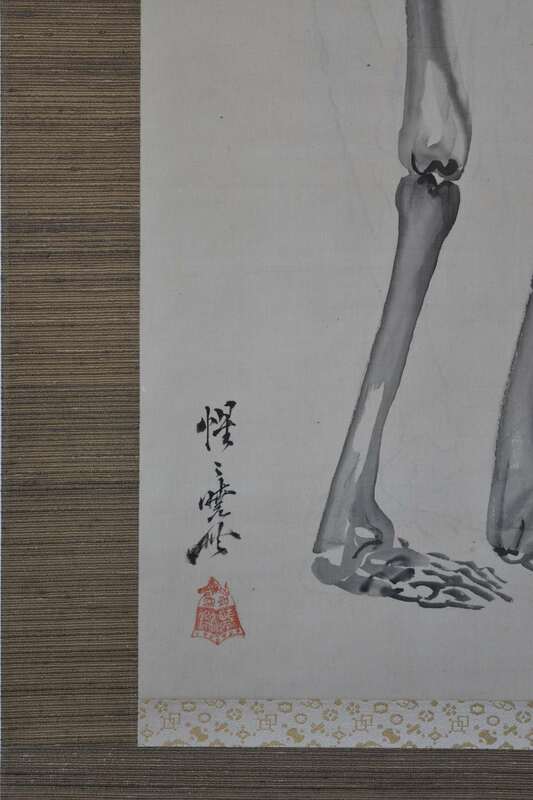 This newly discovered painting shows a full-length skeleton humorously hiding its genital area – not with a fig-leaf – but a large lotus leaf. Sumi and light green on silk, 38.75 x 13 in; 98.5 x 33 cms. Interestingly, a very faint under-drawing can be seen where he first thought of placing the figure. Many copies of his work. In very good condition. Signed Seisai Kyosai with bell seal.